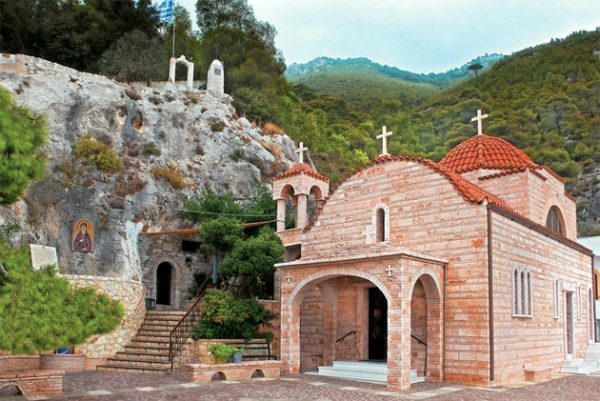 At the 7th kilometer of the road Loutraki – Perachora, turn right we are on the way to the monastery of Saint Patapios. At one of the outskirts of Gerania, it rises imposing, at 700 meters. Approximately 150 steps, they have a helical course that brings you to the Monastery, built in 1952. After seeing a series of monasteries and climbing even higher, we find the entrance of the monastery. Before we reach the front door, we can see the chapel of Mary of Egypt, one-roomed, domed and elegant, with built-in temple and plaster decorations. We climb higher and enter the interior courtyard and have before us the magnificent view of the Corinthian, foreground Loutraki. The iconostasis is stone-built with 2 gates, marble pilasters in the Beautiful Gate and infrared with schematic representations of paleochristian basilica. The wall paintings date back to the 13th century.